Sony Vaio keyboard help needed! I have a Sony Vaio laptop (model VGN- SZ3VWP). Unfortunately our 2yr old decided a while back that most of the keys on the keyboard were superfluous and he pried them off (see above). He was so proud!!! There doesn’t appear to be a Sony repair center in Seville – well the only ones I could find were for audio/hi-fi and didn’t want to know about laptops! The keyboard appears to be beyond repair, (though I’d love to have someone tell me otherwise) so I probably need to find some way to get it replaced. 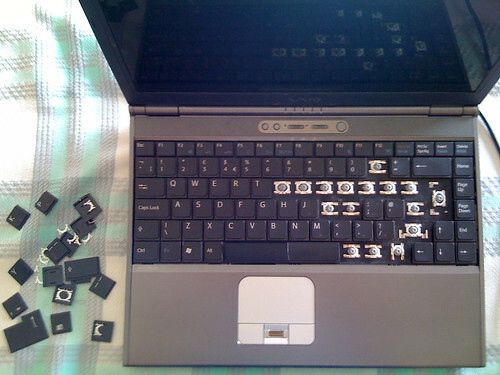 If I could get my hands on a keyboard, I’d have a go at replacing it myself. Anyone any suggestions on the best way to proceed with this might be?